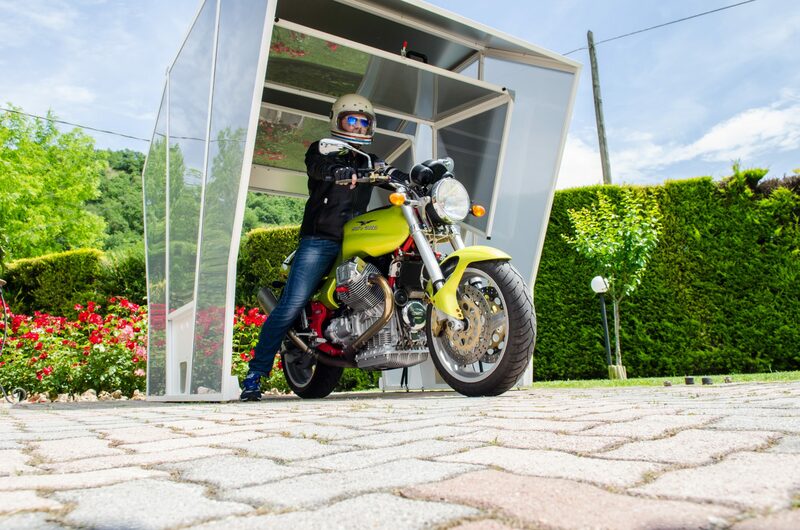 The Gazebox is a giant folding box for your motorcycle. 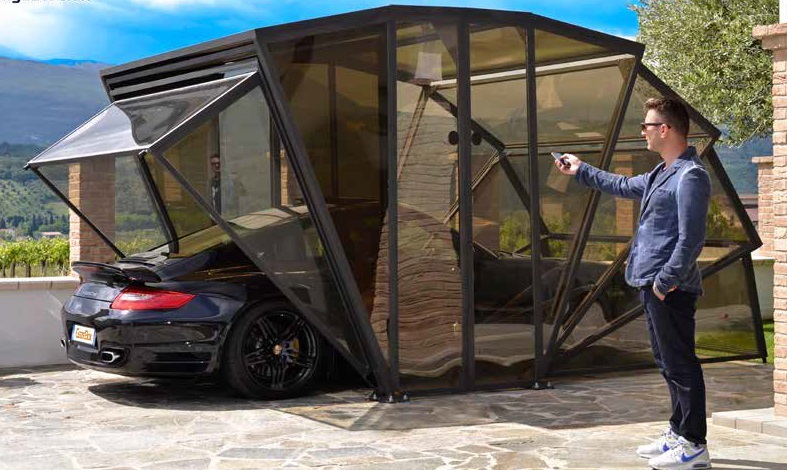 Gazebox’s patented, Italian design is how it can deliver so many benefits. 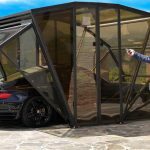 The zinc-plated, powder-coated iron and aluminum framework holds the UV-resistant polycarbonate panels in place. The structure installs in minutes, secured to ground anchors so it can be easily moved. The clamshell-like doors are easy to open manually, but there’s an optional remotely triggered motorized door system to make it even easier. No matter the weather, your motorcycle is protected. Keeping your bike safe from the elements is a big benefit. Gazebox’s unique design, with openings between the panels designed to resist greenhouse-like heat build-up, will also protect your ride from rain, snow, and dust. Unlike a cover, it’s designed to resist even extremely high winds. An optional fan system, run by external power or available solar panels is a good pick for those of us in sunny climes. And if you get a lot of snow, no worries; the shape is resistant to even heavy snow loads. There are tons of options for Gazebox, including remote openers, solar panels, custom LED lighting and more. 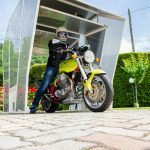 With an approximate 11′ by 6′ footprint and almost 8 feet high, the Gazebox Moto is big enough to store about any bike you can imagine, with room for you to work on your bike in a sheltered space. But Gazebox makes many other sized models, from one built for a small car to a giant structure big enough to enclose a swimming pool. It also offers models designed to enclose patios, balconies, and other outdoor spaces. It’s easy to make Gazebox your own as you can order it in multiple configurations. The frame is available in a range of colors to match your bike, and you can order different colored polycarbonate panels as well as LED lighting systems to match your mood. Additionally, you can order vinyl wrapping in any color, pattern or style you can imagine, from carbon-fiber-look to wood paneling to brushed aluminum. 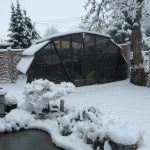 The Gazebox is ready to order and can be shipped to your door, ready to assemble with minimal tools. 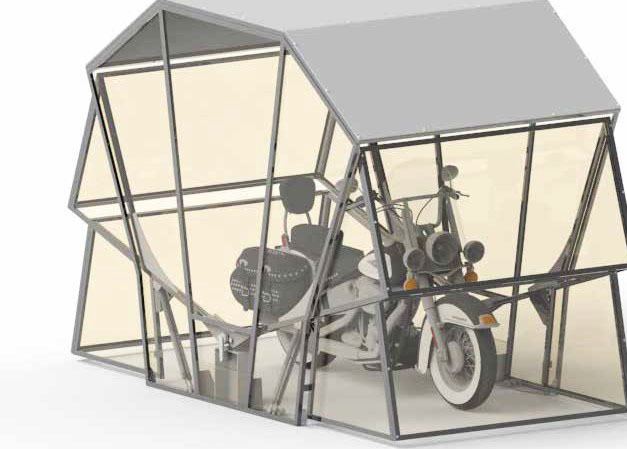 Pricing starts at $5,000 for the basic Gazebox Moto. Call (925) 215-7022 for inquiries within the US, or for international customers, call +39 085 856 9009 (they’re in Italy), or email [email protected], or check out more photos and videos at buygazebox.com. 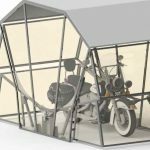 The standard Gazebox Moto has plenty of room for two smaller bikes, or room for tools or a small workspace.